How to use a hardwood Drum sander. Becareful, you can seriously injure yourself and others, if, you use this hardwood refinishing flooring tool, incorrectly. Belt and drum sanders are designed pretty similar to each other. You have a drum in the front, where you load your paper, motor on top with a 60 foot power cable, long control arm for the handle and lever, with a dust bag attached to it. Some are equipped with a 110 or 220v motor. Operating them is similar. Use the control lever to lower and raise the drum. Feed it, forward and back. Dust bag gets full, you empty it. Simple enough to learn, but hard to master, except for emptying the dust bag. Using a hardwood drum sander is very simple. The trickiest part is managing your power cable, without running it over or tripping over it. Here's a tip: If, you know how to Fly Fish, you can manage your wire easily. Do a roll cast to roll it out to the side, or a forward and then back cast to place it behind you. Or have a helper control the wire while you're operating the hardwood refinishing flooring tool, careful not to trip over it. Before we start, picture an airplane landing and taking off. One smoothly lands on its wheels, as another takes off into the air. Memorize this motion, this is the same motion, you will use to raise and lower the drum, on the hardwood drum sander. Put that drum down too hard, and you'll gouge the floor, Raise it too fast, and you'll have unevenness. You can avoid a lot of work and sanding repair. If, you can avoid these two common mistakes. Like anything, it takes practice. Practice a few passes on a sheet of plywood, to get familiar with controlling the floor sander, and a good feel of the lever. 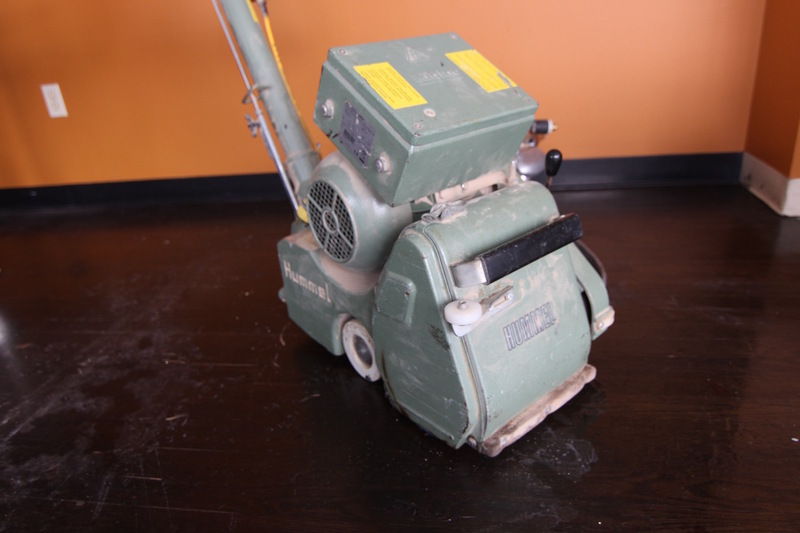 Flooring Tool Renting Tip: For heavy or aggressive sanding, use a drum floor sander. You'll need horsepower to refinish old hardwood floors. Plus the sandpaper will less likely break on you. For finesse sanding, stain finish, Tung oil wood finish, and 1 coat systems that requires fine sanding. Use a belt sander, for sanding wood floors, you can get grits up to 120. Note: Your drum sander may be pitched to one side. This will determine which side you actually start your floor sanding. If, the machine sands, heavy on the left side of the drum. Your starting side will be on the right and you should work towards the left. Vise-versa, if, it sands, heavy on the right-side of the drum. Using a 40 grit, starting from one corner of the room. I usually start near where my cable is located and work away from it. Keep away from power cables, for safety reasons. Let's pretend the cable is on the right side and the machine sands, heavy on the left side of the drum sander. Sand with the grain of the wood floor. Power up the machine, slowly start moving forward at the same time lower the drum control handle - feather touch. Once you feel the drum, touch the flooring, slowly and gradually release the lever, and proceed forward, at a slow constant speed. As you approach the wall begin to raise the lever gradually. Note: Avoid bumping into the wall, this will apply pressure to the front of the sander downwards, resulting in gouges. Start to move backwards, lower the lever - feather touch, then start to sand backwards. As you return to your starting point raise the lever gradually. You can have someone assist you with the power cable, to prevent tripping over it. Repeat this process until the boards are sanded even to each other. This sometimes takes a few passes, depending on the wood flooring tool being used, horsepower and features makes a difference here. Are you getting the hang of things, yet? Let's continue. Once the flooring boards are even and the old finish have been completely removed. Move the floor sander over a half drum's width. Overlapping your passes will ensure that you don't miss any spots and you end up with any uneven sanding areas. Repeat this process, until you've completely sanded the wood flooring on this side of the room. Inspect the floor with a bright light to make sure you've sanded all the wood flooring boards evenly to each other and have removed the existing wood floor finishes and any unwanted marks. Before continuing on with your hardwood floor refinishing, re-sand any spots as needed. Once completed, continue on the opposite side of the room. Move any wires and cables that may be in your way, continue with your hardwood floor refinishing, until whole entire room is completed. After, you've finished using the hardwood drum sander with your first grit, continue on to the next grit size up. Repeat the wood floor sanding process, until you've reached your final grit of 100 grit, before continuing onto the next step of your floor sanding. Tip: Set any nails and apply wood putty to any gaps, before you start your final grit. After, you've completed the hardwood floor sanding, clean debris if, necessary. There are advance sanding tricks from not having to do, all this work. This involves using other types of sanding equipment. You can find the information in our other pages. For now, you should just stick to the basic step by step procedure, to ensure you get the best results, at the end. When using a hardwood drum sander, sanding backwards can be difficult or awkward. You should sand in a forward motion, only. This will take longer to complete. But, you'll prevent any accidents or injury, from occurring. Using a hardwood drum sander takes practice and repetition to become good at it. Inspect your work to ensure that you're getting the result you want. Look for gouges, missed spots, cuts, or unevenness, correct them as needed, before moving on to the next step.